AAACCK. 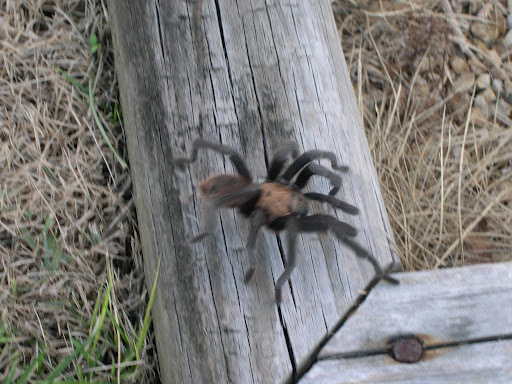 I had forgotten that fall weather brings out the tarantulas. I was sorting green tomatoes to make relish when Ron tapped on the kitchen window and motioned for me to look. I grabbed the camera and hurried outside. As you can tell in the first picture, this baby was on the move and nearly crawled out of the frame before I could snap the shutter. Then it was on top of the landscape timber still moving at a blurr. I tried to get Ron to stick his hand down to stop it but the best I could get him to do was put his foot in front of it. 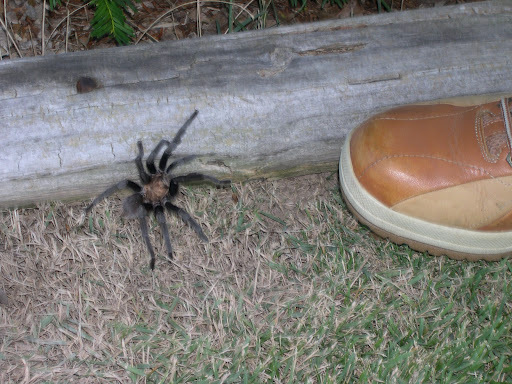 Thankfully, these were taken in front of a neighbor’s home and the creepy crawlie was not on the move to my house. I never work in the garden without first swishing things around to make any tarantulas or snakes run the other way. My momma didn’t raise a fool! ****UPDATE*** while I was writing this Ron pocked on the office window. It seems a family member was trying to climb up the wall of the house. By my bedroom….not sure I will get lots of sleep tonight. EEEEKKKKK I swear I'll never ever complain again about stink bugs fall invasion! Where are you? 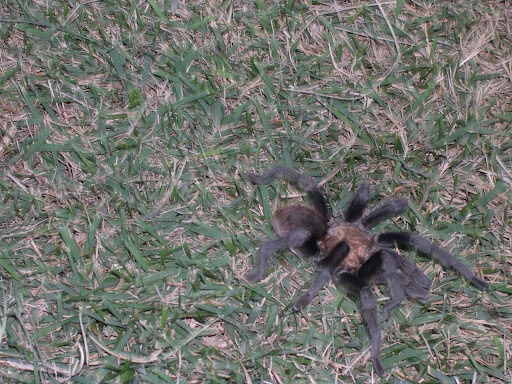 I remember driving through the panhandle of Texas one year when the spiders were mating….running across the road. When you ran over them, it was like going over hundreds of speed bumps. I told my hubby, don't stop for anything! Not even a flat. One of these darling little things got loose in my 1st grade classroom! Talk about chaos… The custodian and I were able to locate and trap it. The little boy who had brought it in to share was thrilled to release it in the nature area behind the classroom. Happy ending to a scary event for the kids and the mega-spider!